Watching all 40 of the 2018-19 college football bowl games and the national championship is no easy task and most of them will likely be snoozers anyways. 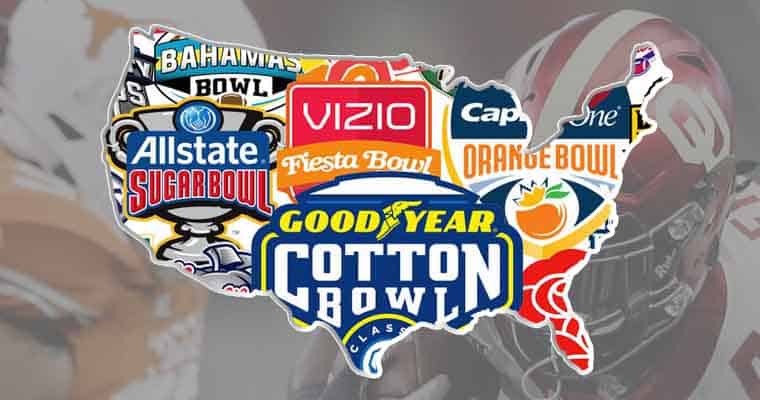 Because of this, we decided to rank the top 10 games you must watch this bowl season, so you know which games will be the most exciting to watch for both fans and those of you who are looking to put some money on matchups this bowl season. These games feature teams that have the most at stake as we begin looking forward to the 2019 college football season. Why You Should Watch: If you like points, then get ready because this has the potential to be the highest scoring game in the entire bowl season. The Missouri offense averages 37.1 ppg and is led by Drew Lock, who is the top quarterback prospect for the 2019 NFL Draft and could be the first player off the board. Oklahoma State’s offense averages even more points, putting up 38.4 ppg against “defenses” in the Big 12, but will be without star running back Justice Hill, who is leaving early to prepare for the draft. However, neither team boasts a particularly impressive defense, which is especially true for the Cowboys, who allow 32.4 ppg – ranking 97th in the nation. Expect Lock and the Tigers to put up at least 40-plus points against Cowboys, who will likely respond with a 40-plus effort of their own. Why You Should Watch: One of the most intriguing matchups of the bowl season features the Iowa State’s stubborn defense, which held Big 12 offenses to 22.5 ppg, versus Washington State’s high-flying offense that averaged 38.3 ppg in the Pac-12. Coach Mike Leach got a great senior season out of quarterback Gardner Minshew, who finished second in the FBS in passing yards (4,477) and fifth in touchdown passes (36). However, against the rival Huskies in the final game of the season, Minshew had easily his worst game of the season against the best defense in the Pac-12. Coach Matt Campbell brings in an Iowa State defense who is up for the task, finishing the season with 31 sacks and placing 3rd in Big 12 opponent passer efficiency. Why You Should Watch: One team had a surprising season while the other team had a disappointing season even though both finished with identical 9-3 records, and you probably which is which already. Coach Mark Stoops has a chance to lead Kentucky to its first 10-win season since 1977 and will need outside linebacker Josh Allen, who is projected as a top 3 pick in the 2019 NFL Draft, to continue being a monster (84 tackles, 18.5 for loss, 14 sacks) this season. On the opposite side, Penn State coach James Franklin will try to get at least 10 wins for the third straight year. This will be the last game for senior quarterback Trace McSorley, who has been the starter for the Nittany Lions for the past three seasons. He played much of 2018 banged up with injuries, but a month of rest will likely help against a Kentucky defense that allowed only 16.3 ppg, ranking 8th in the country. Why You Should Watch: Georgia and Texas are filled with young talented rosters, especially Georgia, who will likely haul in another top 5 recruiting class in 2019 since coach Kirby Smart took over the program. Texas coach Tom Herman struggled in his first season, but the Longhorns were one of the nation’s most-improved teams in 2018, earning a trip to the Big 12 title game before falling to rival Oklahoma. Georgia quarterback Jake Fromm is one of the most efficient passers in FBS, finishing the season with the 3rd-best QB rating in the nation. Sam Ehlinger has improved significantly as a passer, but his ability to run (418 yards, 13 rushing TDs) is what sets him apart, which has given Texas a jolt on the offensive side of the ball this season. Ehlinger and the Texas offense will need to put up a lot of points on the Bulldogs defense (18.5 ppg allowed) if the Longhorns want any chance of beating a team that nearly upset No. 1 Alabama in the SEC Championship. Why You Should Watch: “The Granddaddy of Them All” will be the final game for coach Urban Meyer, who compiled a 186-32 record at Bowling Green, Utah, Florida, and Ohio State while winning the national championship three times, two (2006, 2008) with the Gators and one (2014) with the Buckeyes. Though not without controversy, coach Meyer will go down as one of the best coaches to ever coach the game of college football. Coach Chris Peterson has brought Washington to the top of the Pac-12 in two of the past three seasons, and while the offense struggled in 2018, averaging only 26.6 ppg, the defense ranked 5th in the nation, allowing only 15.5 ppg. The Huskies defense will have to figure out a way to slow down quarterback Dwayne Haskins, who led the FBS with 4,580 passing yards and 47 passing touchdowns (both Big Ten records) while finishing 3rd in the Heisman voting. Coach Meyer has never coached in the Rose Bowl and the Buckeyes will try to get him to win No. 187 in the final game of his coaching career. Why You Should Watch: UCF holds the nation’s longest current winning streak at 25 games. Last season, UCF finished with an undefeated 13-0 record by beating Auburn in the Peach Bowl, which resulted in them declaring themselves the 2017 national champions. Heading into another bowl game at 12-0 after not being selected for the playoffs, UCF looks to take down another SEC powerhouse in LSU, who have one of the best defenses in the country but will be without star cornerback Greedy Williams, who will start training for the 2019 NFL Draft. UCF will be without starting quarterback McKenzie Milton for this bowl game after a season-ending knee injury and will likely need backup Darriel Mack Jr. to have another six-touchdown performance, as he did against Memphis in the AAC Championship if the team wants to have any chance of beating LSU. Why You Should Watch: Both teams appear to have a bright future with coach Jim Harbough nabbing some of the country’s best high school talent – 5-star safety Daxton Hill, specifically – for Michigan on early signing day and with coach Dan Mullen bringing Florida back into the national spotlight in his first season, improving a Gators offense that averaged 22.1 ppg in 2017 to a respectable 34.5 ppg in 2018. However, both teams feature top-ranked defenses, and Michigan was even ranked No. 1 before playing a certain game that fans would like to forget. DT Rashan Gary is skipping the bowl to prep for the 2019 NFL Draft after being an anchor on the Michigan defense for the past three seasons. Florida has never beaten Michigan, and with the two teams on the cusp of vying for a playoff spot next season, it makes winning this matchup even more important. Why You Should Watch: Freshman quarterback Trevor Lawrence, who was a 5-star high school recruit and ranked by many as the best prospect entering college football, got the nod as the starter from coach Dabo Sweeney in late September and never looked back, leading Clemson to an undefeated season and earning the Tigers their fourth straight playoff appearance. Notre Dame quarterback Ian Book became the starter for the fourth game of the season and has led the Fighting Irish to an undefeated season and first appearance in the playoffs. Coach Brian Kelly must find some way for Notre Dame’s offensive line to protect Book against the Clemson defensive line, which is arguably one of the best that college football has ever seen. If they fail to do this, then it will be a long day for the Notre Dame offense. Why You Should Watch: All eyes will be on Oklahoma quarterback and Heisman Trophy winner Kyler Murray and Alabama quarterback Tua Tagovailoa, who finished second in the Heisman Trophy voting after being the favorite for most of the 2018 season. Because of these elite quarterbacks, both the Sooners and the Crimson Tide boast two of the best offenses in the country, averaging 49.5 and 47.9 points per game respectively. Coach Lincoln Riley will need to patch up Oklahoma’s swiss cheese defense (32.4 ppg allowed) and the Sooners defense will need to improve substantially over the next couple of weeks in practice if it wants any chance of matching the intensity of another top-tier Nick Saban coached Alabama’s defense, which ranks as one of the best in the country (14.8 ppg allowed). And let’s not forget, the Alabama defensive unit will be even more motivated to shut down Murray after he took home the Heisman Trophy instead of Tagovailoa. Why You Should Watch: Besides this being the game that determines the national champion for the 2018 season, it will also likely feature the two teams most people predicted would be here at the end of the season. It would be fair to say Clemson coach Dabo Sweeney and Alabama coach Nick Saban are the best coaches currently in college football, and for Saban, a case could be made that he’s the great college football coach in the history of the sport. Nevertheless, Clemson vs. Alabama: Part IV – should it happen – will feature two of the best quarterbacks in the country when Clemson freshman Trevor Lawrence and Alabama sophomore Tua Tagovailoa take the field. In addition, a slew of future top picks in the NFL Draft, both on the offensive and defensive side of the ball, will allow this matchup to live up to all the hype.